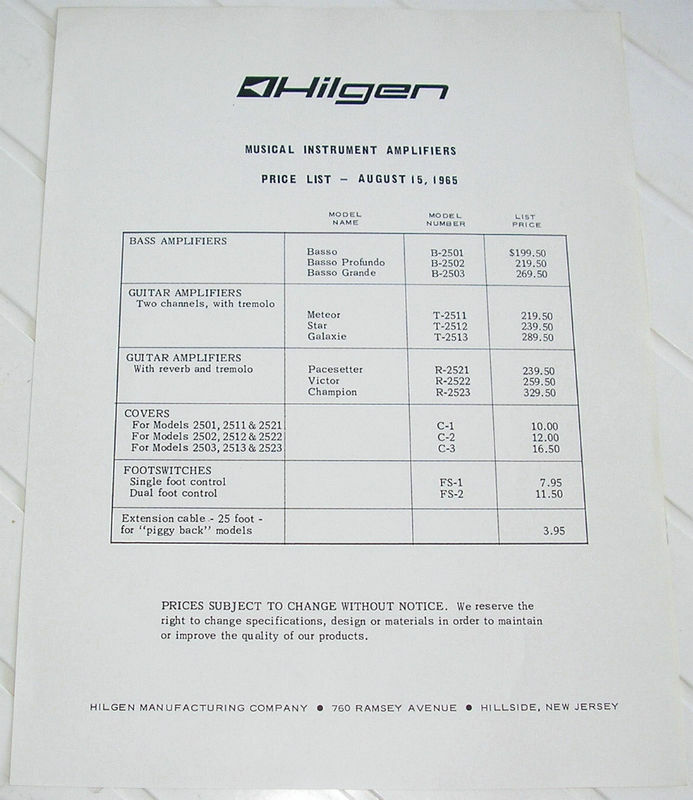 This document provides circumstantial evidence that, in 1965, Hilgen produced (or intended to produce) three bass amplifiers, three two-channel guitar amps with tremolo only; and three guitar amps with reverb and tremolo. However, as discussed elsewhere on this site, I have thus far found no evidence that the T-2512 Star was ever produced. On August 31, 2013, I received a form entry from a person who reportedly owns a T-2513 Galaxie: I have requested photographs of the amp to confirm the report. I have seen no examples of a T-2511 Meteor with more than one channel. The list omits other amplifiers that I know to have been produced in 1965: the T-1506Troubador and R-2024 Challenger.